The USDA Polar grade PVC material is attached to the bracket in such a way that the doorway opening is completely covered, even around the hinge parts. This unique door design allows the main cooler or freezer door to be closed without interference. All hardware is constructed of stainless steel with a lifetime warranty against corrosion. The closing mechanism is adjustable to increase or decrease the speed at which the door closes. TMI Polar-Pro™ Swinging Doors allow fast and easy access to walk-in coolers/freezers, especially in high traffic or product sensitive areas. 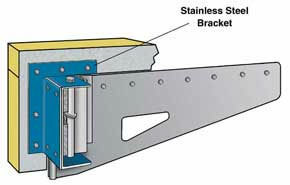 The unique and revolutionary “swinging hardware” design allows the door to open in and out on an even plane, and is the only hardware that maintains a tight seal along the top of the door opening and around all hinge parts. This stainless steel hardware system is also the only fully adjustable system for in-jamb alignment, as well as, the opening and closing speed of each panel. With three sizes, the Polar-Pro™ can be applied to door openings up to 60'' wide and door heights up to 108''. The USDA Polar grade flexible PVC panel material is available in clear, orange, gray, black, white and blue, and in two thicknesses, .080'' and .120'' (clear .080'' thick is standard). 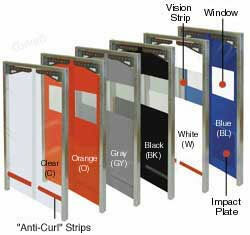 “Anti-Curl” strips are a standard feature on the Polar-Pro™ Swinging Doors. 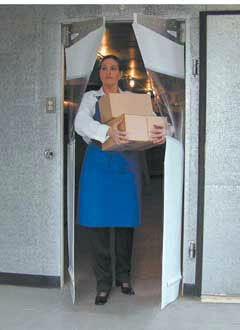 The majority of all walk-in cooler and freezer doors are flush with the inside wall when closed. Our Polar-Pro hardware is designed and engineered to fit every application because it is installed inside the cooler or freezer on the wall surface, next to the door jamb. to create a tight seal. 2.If the spring tension needs to be adjusted, use an allen wrench to tighten or loosen the tension screw, altering the door speed.